Wow that looks good. After years of being accused of being cheapskates, Rogers has opened up the pocketbooks and taken on some major commitments. A total of $163M in salary is coming to Toronto and that doesn't even include what Bonifacio is due to earn in arbitration. Let's take a look at the different pieces of the deal. First the Miami franchise. They acquired some nice pieces in this deal which I'll get to, but the team is a disaster right now. After moving to Miami and building a new stadium with $360M in public funds the Marlins made a big splash in the offseason with the signings of Buehrle, Reyes, Heath Bell, and acquiring manager Ozzie Guillen. 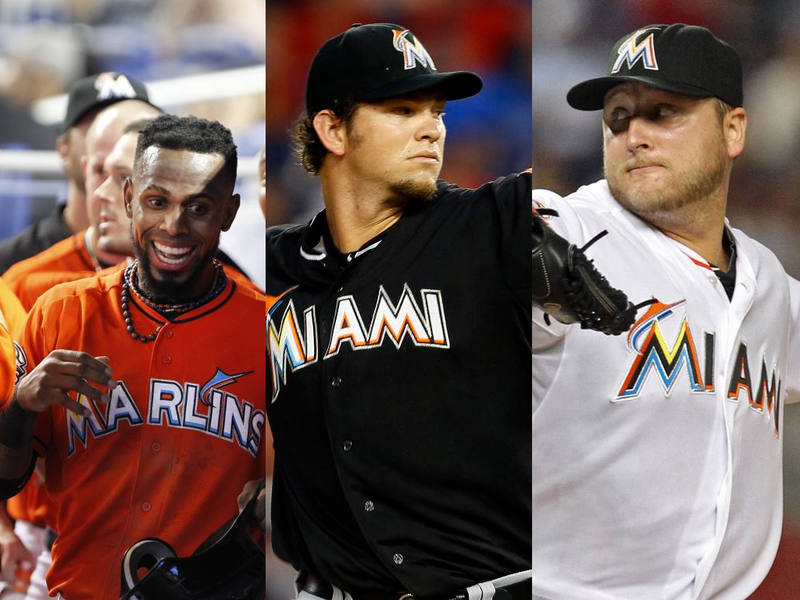 Those guys are all gone now, along with Omar Infante, Anibal Sanchez, and Hanley Ramirez, who all started the season last year with the Marlins. No doubt it was a disappointing season in Miami last year but it hardly called for such a massive overhaul, especially given the massive investment both in money and years given to some of these players. Marlins fans should feel screwed and Marlins players can't be too comfortable in their current situation. I don't know how much longer Giancarlo Stanton will stay in Miami, but unless they can offer him a ton of money with a no trade clause I don't see why he would want to stay and play for an ownership group that can't seem to decide on what direction to take the franchise. Almost everything that isn't nailed to the floor has been shipped out of town and it wouldn't surprise me if guys like Ricky Nolasco were playing in a different city when the 2013 season starts. After previous fire sales from the Marlins the state of the franchise should be a major concern for Major League Baseball. Given the history, it's no surprise that guys like Albert Pujols weren't interested in coming to Miami last season without a no-trade clause. I don't know their opinions of Toronto, but Reyes and Buehrle can't be too happy about their current circumstances after making long term commitments to Miami last offseason. Players can be traded at almost any time in baseball but I imagine they thought they'd be spending more than one year in the Sunshine State with no state income tax before heading out to the socialist tundra of Canada. The Marlins are going to have a difficult time attracting free agents in the future given how they treated their last batch. Let's look at the actual players involved in the trade though. The Marlins picked up 3 major leaguers in Escobar, Alvarez, and Mathis, and 4 very promising minor leaguers. Some of this trade looks like it was done due to positional necessity. Hechavarria was the prized shortstop prospect acquired, but after his end of year stint in the majors it definitely seemed as if he can use some more tuning with the bat before being made a full time starter. Escobar is a very serviceable shortstop, who if he rediscovers how to walk could be the best shortstop in the division. Some of the "character issues" that seemed to ruin his time in Atlanta popped up at the end of his stay in Toronto, but I still don't see why the right manager and team atmosphere couldn't alleviate those issues. Maybe Miami is the right place for that. Henderson Alvarez is an interesting player. He'll be pushed right into the Marlins rotation, not that they have a real choice after trading half of it away. After being a bit of an emergency callup from AA in 2011, Alvarez put up good enough numbers in his first rotation stint to earn a second in 2012. In 2012 he made 31 starts but it's tough to tell whether that was due to necessity or skill. Alvarez wasn't terrible last year but he left a lot to be desired. He had a 4.85 ERA and struck out a measly 3.8 per nine innings. Against left handed batters he had major walk problems and tended to get hit hard. He's also probably going to need to throw his offspeed pitches more (and more effectively) if he's going to remain a starter. He's only 22 though and skipped AAA, so he could definitely still improve. Moving out of the AL East into the NL will probably also make him look better. The Buck-Mathis part of the deal isn't particularly interesting. They both have one year left on their deals and would have to be backups in Toronto. This looks mostly like a way for the Marlins to save about $4M. Mathis is the better defensive catcher but excluding last year's catastrophe for Buck, he has been the far better offensive player over their careers. If Buck can get close to to the performance he had in his previous stint with the Jays in 2010 which was his career best, he'll be one of the best backup catchers in the league. If he's good enough and d'Arnaud progresses fast enough then Toronto could definitely have a catching controversy on its hands by the end of the season. I don't really know where Bobby Wilson fits into any of this. It seems like his only opportunities are going to come from injury. Now onto some of the prospects, which in addition to the previously mentioned Hechavarria is why this deal actually got done. If we go by Fangraph's most recent rankings, the Marlins got the Jays' #5, #6, and #10 prospects from a well stocked farm system. There was no way the Jays were going to get through this deal without giving up at least one of their big arms from Lansing and Justin Nicolino was the Marlins' prize. Nicolino is a lefty with excellent control who has already shown above average command of his offspeed pitches, the curve and changeup. He doesn't project to be a power arm but he's only 21 and has been progressing well through the minor leagues. Depending on the list you look at, Marisnick was often rated as the top outfield prospect in the Blue Jays organization. The inclusion of Marisnick may have been a bit more exciting a year ago before he had some trouble against the higher level hitting. His swing has been reworked a couple times but he still projects to be able to hit with power. He is a tremendous athlete who has shown to be an excellent outfielder. After last season it's clear he still needs some more work with the bat, but he can definitely be a starting outfielder in the years to come. DeSclafani is not a big prize from this trade as he projects to be a reliever. He's still probably a couple years away from big league time though which will give him the time to work on his secondary and offspeed pitches. Looking at the prospects given up in this deal it's impressive how much the Marlins were able to get while simultaneously how little the Blue Jays had to give up. After years of working the draft and loading up on prospects the Jays had one of the top ranked farm systems in the league. The Jays were able to keep two of their three Lansing arms, they kept d'Arnaud, Gose, Osuna, Norris, and their entire 2012 draft class, among others. We've seen how trades for other superstars, such as what the Phillies did for Halladay and Lee had wiped out farm systems and nothing close to this has happened for the Jays. There aren't many other teams in baseball that could offer such a prospect load and still keep together a highly rated minor league system. Let's turn our focus to what really matters for Jays fans though: Reyes, Johnson, Buehrle, and Bonifacio. First off, WOW! These guys aren't without their warts, but oh my god, when was the last time we saw such talent come into Toronto? Roger Clemens? He was just one guy. We'd probably have to go back to 1990 and look at the trade for Alomar and Joe Carter. It's an exciting time to be a Jays fan. The last year or so has been mostly looking at waiver wire transactions on loop while we watched perennial losers like the Orioles pass us in the division. But right now the entire baseball world is talking about how good the Jays can be in 2013 and it's a refreshing change of pace. Over the last 5 seasons Jose Reyes has been one of the best shortstops in baseball. You could make an arguement for Tulowitzki, Jeter, Rollins, or Hanley taking the top seed, but the conversation starts with Reyes. He leads all shortstops in that time in steals and is in the top 3 in both AVG and SLG. The defensive metrics haven't been in his favour the last couple seasons, but back in his real speed demon days he was one of the best fielders around. There are definitely some injury concerns thought. Although he remained healthy most of last year he has had some leg problems in the past, specifically with his hamstrings. For a player so reliant on his speed to be productive, keeping him healthy will be a major priority. Reyes comes to the Jays with what is now the largest contract on the team. He has 5 years and $92M remaining plus a $22M team option with a $4M buyout. It's a big contract but Reyes is still only 29 and if healthy should still be a productive player near the end. Josh Johnson is another player who comes to the Jays with some injury concerns. He's already had Tommy John surgery and has missed significant time in the last couple years due to shoulder inflammation. He managed to make 31 starts last season, but it was his worst year since his first couple in the majors. He's only had one season with 200+ IP but hopefully he'll have the strength to keep up this season. There are definitely some concerns with him moving from the NL to the AL East, but he has a 2.95 ERA in inter-league games (albeit in only 109.2 innings) and he's not especially home run prone, so it looks promising. Johnson's contract will make is situation with the Jays interesting this year. He's in the final year of his deal and will earn $13.75M this season. If he stays healthy he'll be one of the top free agent targets next offseason so it's tough to imagine he wouldn't want to test that. The Jays will likely extend him a qualifying offer at the end of the season but there's definitely no guarantee that he'll be in Toronto for more than one season. If the Jays are out of it down the stretch his name will probably also appear as one of the top trade targets in the rumour mill. I've always had a bit of an irrational love for Mark Buehrle. I used to love seeing his duels against Roy Halladay border on the two hour mark for the entire game. In the age of Daisuke Matsuzaka staring into space between every pitch, it's relieving to see a pitcher stay on the mound and keep up a good pace. Buehrle is starting to get up there in age but there are few 33 year olds pitching who I would be less concerned about. Buehrle has been the absolute mark of consistency, starting 30+ games for the last 12 seasons. He'as a soft throwing lefty who doesn't strike out a ton but he has remarkable control and can be trusted as a work horse for any team. Against all odds he's thrown a no-hitter and a perfect game. He has a career 3.88 ERA against the AL East in 517 IP, although that goes up to 5.27 against just the Yankees and Red Sox. Either way, I'm excited to have someone reliable in the Jays rotation and he should be fun to watch for the next three years. Bonifacio is entering his first year of arbitration and will be an interesting fit on the Jays. He doesn't hit for any power (7 career HR) but he can absolutely fly. In the last three seasons he's stolen 82 bases while being caught only 14 times. His 30 SB last season came in only 64 games. I'm not entirely sure where he fits on the Jays roster though. He's traditionally played CF or 2B but those spots seem to be currently occupied by Rasmus and Izturis. He could play LF but I'm not sure how much of a better option he is than Rajai Davis. A lot will depend on who the Jays hire as their next manager and how he likes to utilize speed. Between Reyes and Bonifacio coming in, and Davis and Gose already rostered, the Jays will probably be tearing up the base paths next season. Hopefully the new manager will use a little more discretion than Farrell though when determining what situations to give the green light in. Speaking of the new manager, I keep seeing how now after this trade the Blue Jays managerial job has become much more enticing. Seriously?!? There are 30 manager positions in the MLB. In any given season there are about a half dozen openings. There is currently one. Almost every ex-player, newscaster, and fanboy would sell their soul to get one of those positions. Unless you're a guy like Terry Francona who can pick any job he wants (and have you seen the Indians roster?) the players on the team shouldn't really matter to a potential manager. The fact that the job is open is usually enough. I'll conclude this on an upbeat note. For a few years now we've praised Anthopoulos and his strategy in acquiring players. The process has seemed sound even if the results weren't. Trusting the process can become difficult though after repeated disappointments. Well here we are with another trade that was a result of great moves by the Blue Jays front office. It might not work out, players can get injured, age, or just lose their talent; but today I feel more optimistic as a Jays fan than I have in a long time and I can't wait for the 2013 season to start.